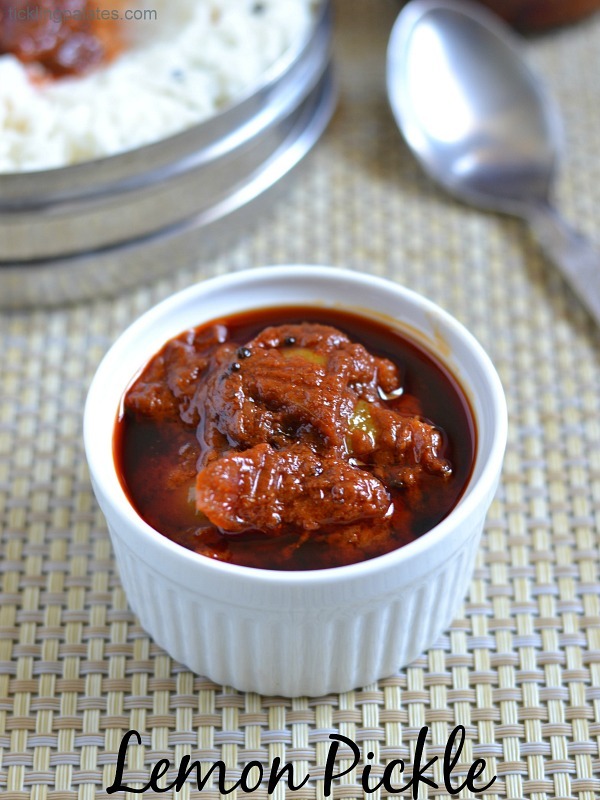 Lemons are available in India all around the year and this lemon pickle is an easy way to store and enjoy them in our diet on a daily basis so that you can get your daily dose of Vitamin C. When you make lemon pickle this way, you need not have to wait for a month for the pickle to get ready as it gets ready in just 3 or 4 days and also there is no fear of the bitterness from the lemon skin transferring to the pickle when you store for many months. Summer is an apt time of the year to make pickles. My Grandma always used to preserve lemons from her garden in a big jar so that she can make the pickle at the drop of a hat. 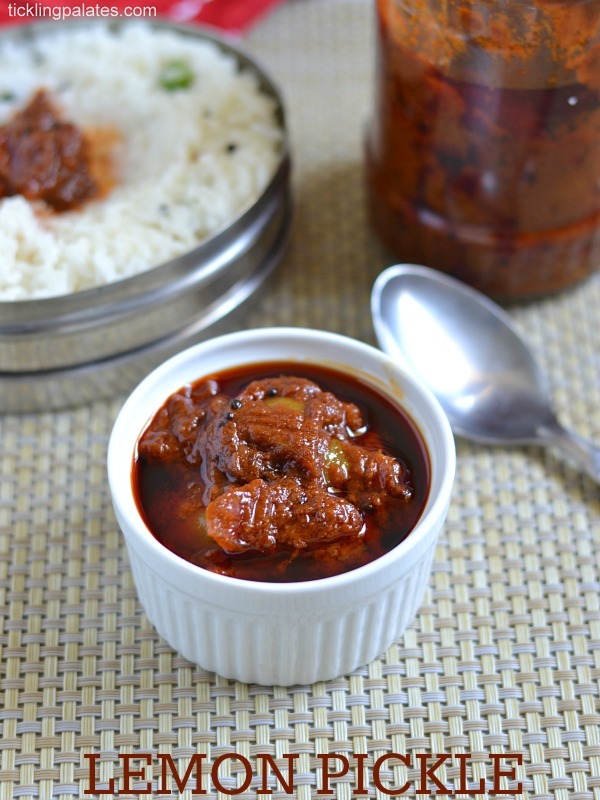 She used to make this lemon pickle and gift it to relatives and friends. A few months ago when my MIL visited me, she brought some lemons from her garden an we made this pickle but unfortunately I couldn’t click any pictures as it got over very soon. The veggie vendor gave some 20 lemons last month from his garden and I made this again so that I could share this easy pickle recipe with you all here. I got pickles that filled a 1/2 kg bottle after pickling those lemons. As the mercury keeps rising, curd rice and an assortment of pickles like Avakkai pickle are enough for me to pass this Summer season. So go make some following this easy recipe and enjoy. 1. Wash and dry lemons. Either wipe with a cloth or spread it on a plate or cloth to dry out. 2. Keep it immersed in hot water for it to soften overnight. 3. Chop them into quarters or into bite sized pieces. The juice that comes out is important as that itself acts as a preservative. So do not discard it. 4. Mix salt and turmeric powder and toss well. 5. Grind fenugreek seeds. Add chili powder, salt. (I forgot to click that step). 6. Heat oil, crackle mustard, mix in the pickle powder, lemon and mix and your lemon pickle is ready. – Always choose thin skinned lemons that are free of black spots and even in color for pickling purpose. It should be firm to the touch and there should be no soft spots as those fruits will spoil the pickle. – You can also pressure cook the lemons but it will make them very squishy and they won’t retain their shape well. – Always use rock salt while making pickles as it prevents them from spoiling easily. – Removing the seeds from the lemon while cutting is optional. I don’t remove the seeds as they do not give a bitter taste to the pickle. – Do not add the ground powder to the hot oil as the color will change and the pickle will get a burnt smell. – Always use sesame oil while making pickle. No other vegetable oil will as they will change the pickle’s flavor and aroma. – Use clean, sterilized bottles. Dip clean, soap washed bottles in hot water and let it soak for 15 to 20 mins. Drain the water and let it air dry. I always keep them under hot sun before storing pickles. 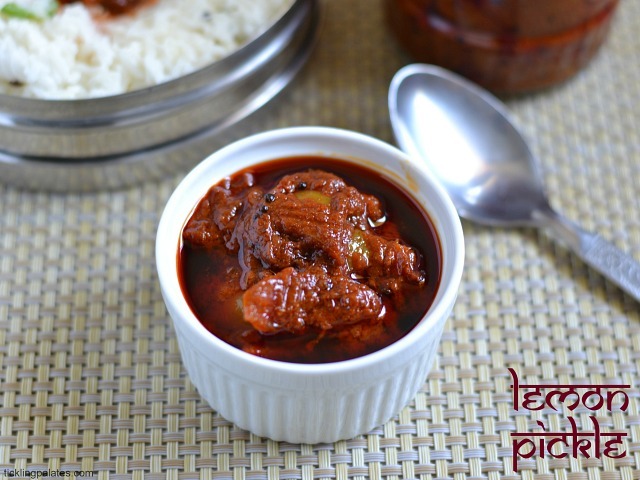 Lemon pickle recipe with step by step photos. Wash lemons and wipe them clean of moisture. You can also spread them on a plate or cloth and let it air dry completely. Take 5 to 6 cups water in a wide mouthed pan and bring it to a rolling boil. Switch off stove and take the pan off the stove. Drop the lemons into the hot water. Close the pan with a lid. Make sure that the lemons are completely immersed in water. If you think that there is not enough water, heat some more water separately and add to the lemons. Let the lemons soak in the water for 12 hours or overnight. Discard the water the next day. The lemons will be soft to the touch now and slightly squishy. The skin would have softened. Place the lemons on a plate and cut each one into quarters. You can also cut each quarter into half. You can remove the seeds if you want but I did not do it. Transfer the cut lemon wedges along with the juice to any food grade container. Add 1/4 cup rock salt, turmeric powder and shake well. Close with a lid and let it rest for 1 full day. If possible, keep shaking the container every 2 or 3 hours. Heat a pan, add fenugreek seeds and keep shaking the pan to roast it evenly. Do not let it burn. When it changes color slightly, transfer it to a mixie jar. Grind it to a coarse powder. Add remaining 1/4 cup rock salt, red chili powder to the jar and grind well. The rock salt will get powdered and all the 3 ingredients would have mixed evenly. Heat a thick bottomed pan. Add 1 cup oil and heat it well till you can see it smoking. Switch off, take the pan off the stove and keep it on the counter. Add mustard seeds and let it crackle. Add asafetida. Let it rest 5 to 10 mins for the oil to cool down a bit. Now add the powdered contents (pickle powder) from the mixie jar first and mix. Then add the soaking lemon wedges along with the juice and mix well. Let the pan cool down completely to room temperature. Lemon pickle is ready. You can start using it after a day or 2 as by then the spice powders will get absorbed well by the lemons. Using a dry spoon transfer the pickle into clean, sterile bottles. Add the remaining oil too so that it floats on top of the bottle. Always use a dry spoon while serving pickles. It would be even better if you store about 1/8 cup pickle separately for daily use and replenish it as and when it gets over. This lemon pickle can be stored at room temperature for 1 year, though I’ve never had a chance to keep it that long as it gets over within 2 or 3 months. Mouth watering pickle. With curd rice perfect combination. Nice outcome dear. 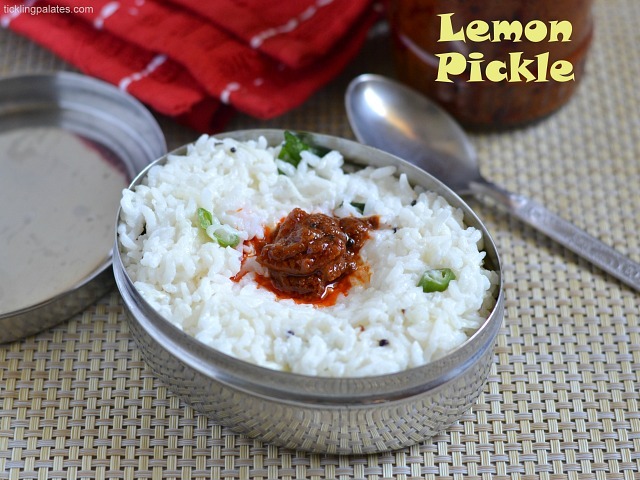 Very well explained.. Looks delicious..
Mmmmm, love lime pickle with curd rice, perfect combo.nice clicks. Finger licking yummy pickle, nicely explained with pics..
radhika, what is rock salt? is it unpowdered white salt or induppu the pink variety called kala namak? Prerna, Rock salt is nothing but Crystal Salt and white in color. (see the 4th picture in step wise pictures) It is definitely not kala namak. Ask for Crystal salt in any store in any grocery shop. dear radhika, i got that salt! it is called khada namak here.. and the pickle came out superb! The taste reminds me of my late mom. God bless you. hi radhika, i started to try this with green lemons i got here in uk. but after i soaked them overnight they haven’t become squishy like your pics show. and without realising that i have added salt n turmeric n left for 1 day..any ideas how to soften this more.? Hi Ruth, Green Lemons will take longer soaking time as they are not ripe. Since you have already added salt and turmeric powder, leave it as such for a week. the lemons will soften and you can continue making the pickle. chances of pickle getting spoilt if some water remains. want to try this tempting pickle. Hi, No need to wipe them dry. While you cut the lemons, it will be pulpy and it will release enough juice. Use everything, that itself will act as preservative. Do let me know how it turns out for you. Thanks for stopping by.